It certainly describes the reaction I got from most people I spoke with who were riding in the area yesterday. 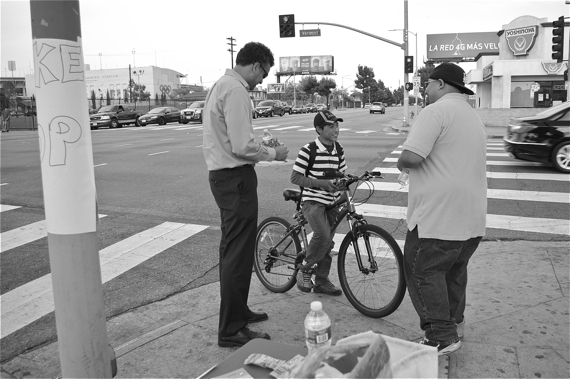 And, it describes a lot of the reactions we got while handing out snacks, maps, and patch kits to commuters heading home on their bikes last night at the corner of Vermont Ave. and Martin Luther King Blvd. in South L.A. 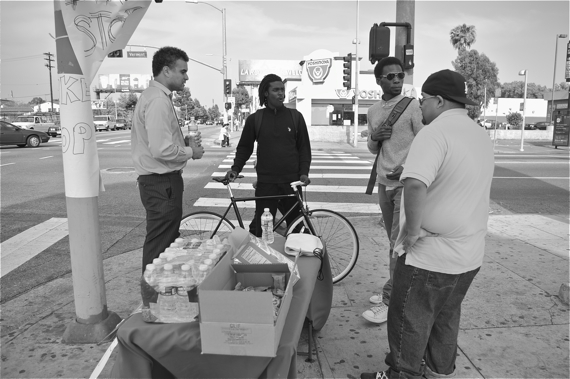 So used to their daily ride were the commuters, in fact, Andres Ramirez and Malcolm Carson of Community Health Councils (CHC) — sponsors of the bike-to-work-day pit stop along with TRUST South L.A. — often found themselves chasing after cyclists and trying to convince them to stop, sometimes without luck. “It’s FREE!” usually did the trick. Once they managed to get them to stop, it was the cyclists’ turn to be curious about what we were doing there. “So, bike-to-work-day is…um…it’s a thing?” a puzzled Isaiah asked, pulling out his calendar. He regularly rides his bike or the bus between his home in Hyde Park and the south edge of downtown, where he works. We tried explaining it was a once-a-year thing to encourage people to try cycling. “Oh,” he said, putting his calendar back in his backpack. He was suddenly more interested in the “Every Lane is a Bike Lane” bumper sticker. “Can I put this on my bag?” he asked excitedly. He was tired of people harassing him as he rode along MLK Blvd, he said. 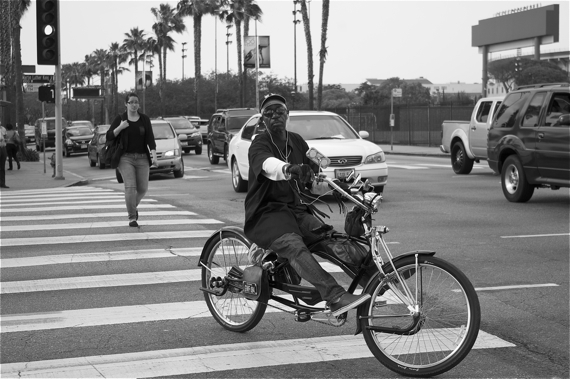 Especially because there wasn’t really anywhere else he could ride — he’d recently been cited for riding on the sidewalk near Crenshaw. He was glad to hear that bike lanes were going in along MLK. Maybe he’d finally be able to ride in peace. 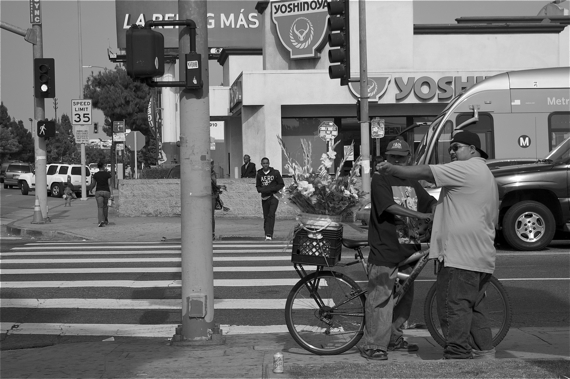 Yes, cars don’t respect cyclists at all, agreed a bicycle flower vendor (above). More lanes were definitely needed in the area. Even with lanes, one woman (left) with her adorable son in tow wasn’t sure she’d feel safe enough to get in the road. We did meet a few people who were cycling by choice. “I’m going home and then going to work out,” a very fit Moammar (above) told me. He was headed back to Culver City after meeting with a landlord about a new apartment. Another poised young man who rides with Major Motion was doing an 82-mile loop. He had been training with the group for about 9 months — even racing occasionally — despite being only 16 years old. Time trials were his favorite, he said. “82 miles…” Tafarai Bayne repeated as we watched the young man clip back in to his pedals and head down Vermont. At rush hour on Vermont, no less, I thought. 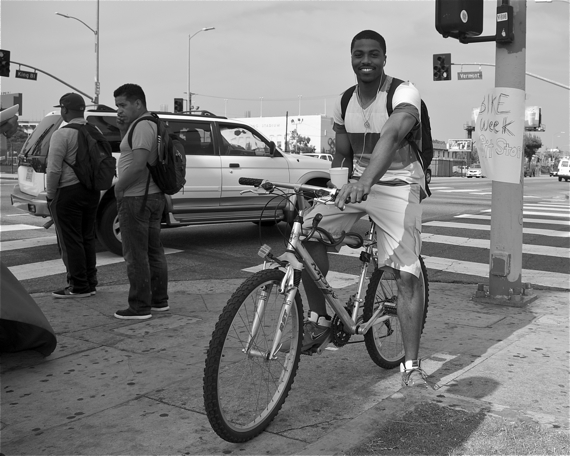 While those choosing cycling by choice — especially the young fixie riders — are growing in numbers, they still represent a minority in lower-income areas of color like South L.A. The concerns of his bike commuting customers (or commuters choosing between transit and cycling) are much more basic, says Stalin Medina of the Watts Cyclery. Number one is the cost of maintenance. A list of Bike Commuting Concerns to be Overcome from the League of American Bicyclists. Click image to see photo on their FB page. “Six dollars is a lot for some people,” he said referring to the cost of changing a flat tire out. Especially because many of his customers are laborers who ride along corridors like Alameda, which tend to be in terrible shape and are often littered with industrial debris. A few flat tires a month could really set back people who are living hand-to-mouth. Moreover, it usually isn’t just the tire that is the problem, Medina says. Often, their rims are damaged from riding along bad roads. And, many have cheap second-, third- or fourth-hand department store bikes which are of such poor quality that the upkeep is more than the bike cost them in the first place. “We really need co-ops in the area,” he concluded. I had hoped to help him open one last fall. It would have been the first in South L.A. But, just as we began making plans for that, Medina, an Army reservist, got word that he would be sent to Afghanistan to bring the troops and equipment home. So, the co-op plans got put on hold. Others in the area — the East Side Riders, Los Ryderz, and members of the Black Kids on Bikes — have all talked about launching co-ops, as well, because they recognize the great need in the area. But, as anyone that helps out at or visits other co-ops around L.A. is aware, they require a lot of know-how and resources just to get them off the ground. Keeping them going requires a lot more. So, maybe if Metro and the city (and the League of American Bicyclists) are serious about promoting biking to work as a viable option, then facilitating the development of co-ops in lower-income areas might be far more productive than offering cyclists tips for how to keep a change of clothes at the office or Clif Bars and Fruit Snacks (although these were yummy and appreciated!). Biking to work should be one of those things that simplifies your life, not complicates it. The easier, safer, and more cost-effective we can make it for people who would benefit most from having cycling as an option, the more sustainable a form of transit it will be. You should look into grant funding for the co-ops. The Obama administration and the state and county departments of health are promoting campaigns in poorer neighborhoods to encourage people to exercise more. Bike co-ops would fit right into that. everyday is bike to work day, cicLAvia!